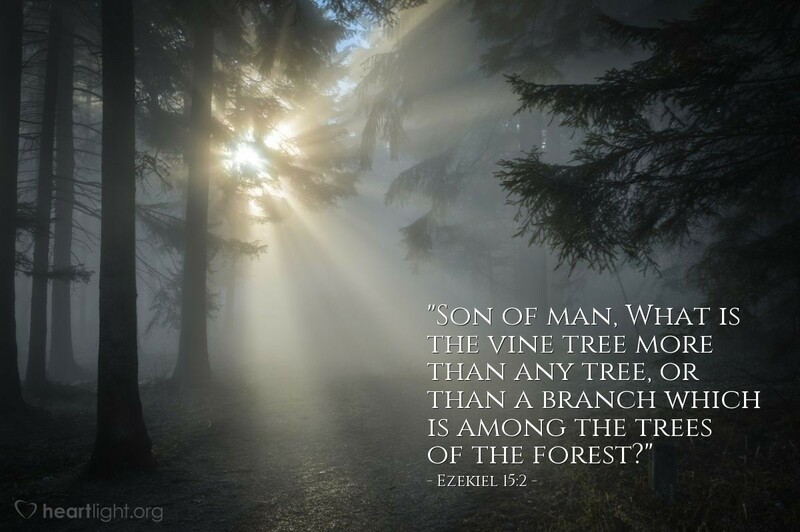 "Son of man, What is the vine tree more than any tree, or than a branch which is among the trees of the forest?" These words are for the humbling of God's people; they are called God's vine, but what are they by nature more than others? They, by God's goodness, have become fruitful, having been planted in a good soil; the Lord hath trained them upon the walls of the sanctuary, and they bring forth fruit to his glory; but what are they without their God? What are they without the continual influence of the Spirit, begetting fruitfulness in them? O believer, learn to reject pride, seeing that thou hast no ground for it. Whatever thou art, thou hast nothing to make thee proud. The more thou hast, the more thou art in debt to God; and thou shouldst not be proud of that which renders thee a debtor. Consider thine origin; look back to what thou wast. Consider what thou wouldst have been but for divine grace. Look upon thyself as thou art now. Doth not thy conscience reproach thee? Do not thy thousand wanderings stand before thee, and tell thee that thou art unworthy to be called his son? And if he hath made thee anything, art thou not taught thereby that it is grace which hath made thee to differ? Great believer, thou wouldst have been a great sinner if God had not made thee to differ. O thou who art valiant for truth, thou wouldst have been as valiant for error if grace had not laid hold upon thee. Therefore, be not proud, though thou hast a large estate-a wide domain of grace, thou hadst not once a single thing to call thine own except thy sin and misery. Oh! strange infatuation, that thou, who hast borrowed everything, shouldst think of exalting thyself; a poor dependent pensioner upon the bounty of thy Saviour, one who hath a life which dies without fresh streams of life from Jesus, and yet proud! Fie on thee, O silly heart!